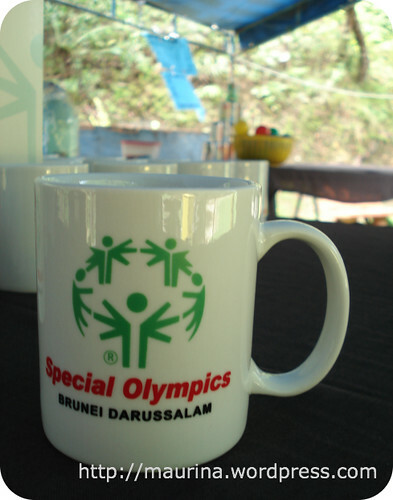 Blog Report: Special Olympics Carnival! Phew, that was a hot day yesterday! The sun was shining, and there was not a cloud in sight! The cool girly bloggers (the ones who could make it anyway hehe), Atul, Ness, Pynk and I came to this fun-filled event wearing pink because it is the unofficial colour for all girly bloggers’ gatherings/day outs. Nyehehe. Well not really, I just made that up. Anyway they were there, and we basically laughed a lot! AS USUAL. Hahaha. The night before when I texted Pynk to wear pink, she said, I DON’T HAVE ANYTHING PINK. So I said, “WEAR PINK UNDERWEAR OUTSIDE LIKE SUPERMAN” which was not to be taken seriously. But you know, she almost did!!! Well, also not really. I’m really just spreading libelous rumours. There were loads of fun filled activities, as per Dr N’s email, which I will try to cover with the help of inadept words (hey, I’m still recovering from the shock of seeing my fried modem) and blurry pictures. As promised there were the flying fox, rock climbing, river crossing via hanging bridge made entirely of rope and one clown. Haha. Also available was, the pinata, rubber gun shooting, bowling using a very old (and wet) coconut, shooting balls into a clown’s mouth, dance lessons, bouncers, and popping balloons using darts! All of these activities are join-able by handing in coupons. Pelangi FM was also present and making a lot of commotion with their face paintings. Some people crowded around certain DJs as you can see, to take pictures. KFC was also there. I find the chicken inside the graduation robe funny. Haha. THE PINATA WAS REALLY CUTE! It was a round, red fish, which had huuuuuge golden lips that reminds me of Drew Barrymore. Nyahaha. Here is a video (with special unintentional commentary) of a girl trying to kill the fish-shaped pinata. After contemplating doing the flying fox near the Tasek Lama waterfall, I finally decided that it is not safe enough (aha, code for “I chickened“), and settled for some “glass painting”. I’ve discovered that I am not very good at it it is not one of my strengths. This was an activity which costs $2, and we get to keep our glasses. Hehe. I gave mine to my Mama, for her to keep her candles in, since it was Mothers’ Day yesterday. Yes, circles are at the pinnacle of art ok. We draw draw draw. Would you like to see the end product of 4 girly bloggers’ combined creativities? Tadaaaaahhhhh! Guess whose is which! I also dragged along Boyfriend, and Sister 4. Other people who also came were: AnakBrunei, I think I saw LSM, (he went past me very fast, so I don’t know if that was him or not???). Ming was that you? Also present were the Good Eggs, with Emma looking very pregnant, but up to mischief as usual. ← Previous Post Hang on! Hey girl, I was there. I didn’t see you but I did bump into AnakBrunei. I was there at about 9:30am but couldn’t stay too long cos I had to be somewhere else by 10:30am. Wow the whole event looked really fun.. 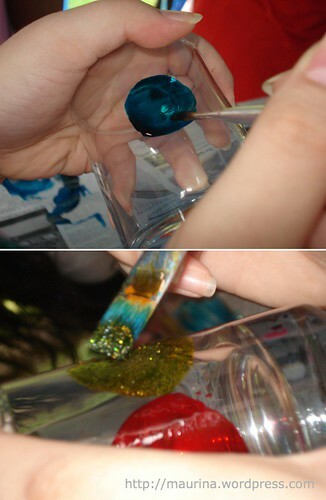 I want to paint on glasses too! If only I was there sure my glass will look the best. 2007 Special Olympic Games is coming closer and closer. A volunteer, coaches, government officers, anyone who supports for the Great Games now is on their ways. They came from different countries to Shanghai, to share the pains and happiness with athletes, to grow with them. What a nice picture!!! PandaPhone respect them like our best friends, Pandaphone want to join the great movement. Pandaphone knows the importance of sharing, of communication, of experience. The Tele-communication bonds our lives together, we insist. We bring them into the movement for sharing. We are not for benefit, we are here for the connecting the world. Share with your lover, friends, family of the Great Game.